Gorgeous cover, isn't it? And given Grant Morrison's customary interest in radical variations of scale (if this were a Wire post, I would've titled it with a certain Van-Zee quote), it comes very close to being a literal representation of this issue, where Superman plays God (in a good way!) with not one but two pocket worlds. The interior is even better. The image of Superman's face smiling beneficently over Kandor (you can see a sample here) is one of Quitely's finest, especially the way he breaks it over two panels--as if we have to pan up to see it all, as if it's too big to take it all in at once. The kind, patient expression sums up Morrison and Quitely's take on Superman at least as well as the cloud cover that opened the series. 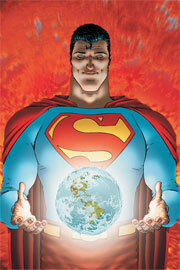 That's only one reason why All-Star Superman was much-anticipated and sorely missed after a long drought. I'm with Jog, more or less--I loved the Zibarro issue (pretty much the best Fourth of July comic ever), but the follow-up with the Kryptonian astronauts didn't seem to bring anything new to its well-worn story. And I say this as someone who deeply appreciated that Morrison finally gave us the Steve Lombard stumblebum routine I'd been begging for. It's been nearly nine months since this series was firing on all cylinders, and even longer since it devoted significant attention to the story of Superman's mortality, but this latest issue returns to the plotline that gave the early ones so much of their melancholy appeal. Among the other features that make this issue so rewarding are the patterns of allusion--and the multiple levels of allusion--that run throughout it. There's this series' standard palimpsest of Superman history, condensing and combining the most interesting elements from seventy years of comics. We get Superman writing his last will and testament on a slab of metal, Leo Quintum in a Flamebird costume, Luthor biding his time in prison, even a reworking of that story where Superman shoots a little Superman out of his hand that so captivated Morrison (note that Van-Zee, leader of the Superman Emergency Squad, is by tradition an exact double for his cousin Kal-El). We get Superman rushing, with a little help from his friends, to complete his unfinished business and expose a secret to the world (prematurely? ), both of which come straight from "The Last Days of Superman." But it's not all Silver Age nostalgia; properly speaking, it's not nostalgia at all. That's most visible in the Kandorian council, which makes a nice visual metaphor for this series' signature move. Their clothing ranges from classic Silver Age headbands and emblems to an ornate Byrne-like headdress to Quitely's own hypermodernist designs. The council is tasked with preserving the last remnants of Kryptonian culture, and their appearance encapsulates just about all of it, much as All-Star Superman tries to preserve all the different eras of Superman--but not under glass, where it can only grow old and die. This is a living history. Then you have all the references to Morrison's own work. You've got the infant universe of Qwewq, where our own planet dwells--only this time it's created by Superman, as one of his twelve super-labors. (I would love that gimmick a lot more if Morrison gave us a scorecard--it's impossible to tell what the labors are!) You've got the radical variations in scale from The Filth. You've got several other callbacks to Morrison's run on JLA, from ominous rumblings about Solaris to a Superman who tells Lex Luthor "I know there's good in you" to maybe, just maybe, a reference to that JSA crossover where Green Lantern artificially accelerated time on that microscopic civilization that was built on top of the Spectre. I'm not so sure about that last one--I think Morrison is really just playing around with that old idea that if the history of planet Earth were fit into a single day, all of human civilization would unfold in its final second. A tad more cerebral than the JLA plot, but they both stem from his interest in narrative compressions of time and space. And boy, do I love Morrison's endpoint for his pocket history of the human race--something that speaks to why he thinks this comic is important in the first place, why All-Star Superman and superheroes in general are, for Morrison, a lot more than just a paycheck. Finally, because Morrison is Morrison--or because I am me?--I see we have a surprising number of references to Alan Moore. Watchmen references abound, with a godlike hero who creates life at the culmination of his ascension and plants a city of delicate spires in the soil of Mars, in the shadow of Olympus Mons. I'll charitably assume the Nietzsche quote originates with Nietzsche, but it does happen to be the same line that opened Miracleman. An obvious place to go if you're looking to give the superhero a (spurious) historical pedigree, sure, but Moore got there first. There's no overlooking the parallels with "Whatever Happened to the Man of Tomorrow?" though--not when we meet a messenger from an idyllic future, who shows up in a transparent bubble, no less, and who isn't supposed to share information with Superman but manages to provide a hint about an upcoming menace. It's the Legion of Super-Heroes cameo updated for the age of text messaging. And it calls attention to all the ways the larger plot structure of All-Star Superman as a whole--a grand tour of all the elements of the Superman myth, in the face of his impending death--owes a little something to Moore's big, serious, heartfelt, slobbery kiss of a Superman story from twenty-three years ago. But it's gentle references this time, knowing winks to the reader. No commentary or anxiety, as befits this most serene of series. Just another nod to the past as this comic walks, square jaw held bravely up, into the future. I think more often than not Morrison has done mere good, not great work since Seven Soldiers ended. All Star Superman 10, however, ranks with Batman 663 ("The Clown At Midnight") among his most interesting issues since 2006. These two show also Morrison's range: Just compare the ebullient, adjective-saturated prose of Batman 663 with All Star Superman's Zen-like dialogue sparseness. The sheer emotional impact of All Star Superman 10 makes me think of Manhattan Guardian 4 which had a similar exhilarating effect on me. That face smiling over Kandor is probably the single best image in the series--certainly the one that best sums it up. I've been pretty disappointed with Morrison's post-Seven Soldiers work too, FrF--and I didn't care for his "Clown at Midnight" prose much at all, though the Club of Heroes story was a big hit in these parts--but this issue was a return to form. I have high hopes for the next two. Good stuff, Marc (I'm hoping to post my own thoughts on this tonight) but Moore didn't get to that quote first - it opens Robert Mayer's Superfolks, from which Moore ripped off huge swathes of plot for both Miracleman and Whatever Happened To The Man Of Tomorrow, and for which Morrison wrote an introduction when it was recently reissued in paperback. I haven't read Superfolks or Miracleman---I just thought of Watchmen, which doesn't use that quote, but which probably contains the only Nietzsche that most comic readers and writers have every read. It works even better though, if that specific quote opens Miracleman, and thus the "negative Nietzsche age" of comics. I think Morrison's point is not to give the comic a pedigree, but to redirect the pedigree that Moore inadvertently bequeathed to superhero comics: neither Nietzsche nor Superman are fascists; both have a largely positive message. Oh, that is a very nice unpacking of the symbolism of the Kandorian council. I certainly noticed the variety of comics eras represented in their costumes...but it never occurred to me that it could be read as a metaphor. And there's real magic in the way GM transmuted that zany image from "Superman's New Power" into something beautiful. Before, it was just a bit of goofy Silver Age crack: suddenly it becomes genuinely touching. These two things surprised me, made me go "aha!" with pleasure. And it's been a while since a comic book made me feel that way. Me too, RAB. This is the kind of comic that I'd hoped every issue of All-Star Superman would be. To be fair, about half, two-thirds of them have been--they just don't come out nearly often enough. Andrew, the Nietzsche quote might come to comics from Mayer, but it definitely came through Moore, and Moore got there well before Morrison. And David, I think you're right--Morrison is placing that quote in the context of a history of human aspiration, not fascism. My point about the pedigree is that Nietzsche really has nothing to do with superhero comics before Moore, or Mayer if you prefer. Morrison places him in a better tradition but still casts him as an antecedent of Siegel and Shuster, which he simply wasn't. Doesn't ruin the payoff for that thread of the plot, though. You can't be surprised that we don't have a "12 labours" scorecard. Remember how tangentially the 7 treasures were handled in 7 Soldiers? Now, if Moore had written the series, each issue would have had its own labour, colour scheme, branch of philosophy, corresponding episode of The Odyssey, type of cheese and patron guest star from the Love Boat (2nd season). The issue with Super-Lois and the Ultrasphinx was crying out for a Charo appearance. This WAS an extraordinarily satisfying issue. I got quite a buzz from reading it. Morrison's got a lot of chutzpah to make Supes God (shades of Ted Sturgeon's "Microcosmic God"), but damned if the results aren't refreshingly, unashamedly, utopian. It's funny, my enjoyment of this series has not translated into an across-the-board willingness to buy everything Morrison puts his hand to, though I will give FINAL CRISIS a look if only to see what he can do under what I presume will be a short tether. I get the feeling that there's quite a bit of Morrison that I not only haven't read but am the poorer for not having read. What's the story on THE FILTH? Jason Tondro's recent PCA paper on Arthurian riffs in Morrison (part of the same panel I was on, actually) has got me convinced that even the JLA stuff would be worth a visit, though, honestly, I read the first arc and it didn't stick. probably contains the only Nietzsche that most comic readers and writers have every read. The hell of which is, it's a misquote. The bit that Moore (or the translator from whom he got it) rendered as "Battle not with monsters, lest ye become a monster"? It's better translated as "Whoever battles monsters should be careful that he doesn't thereby become a monster himself".